OpenOffice is a multiplatform and multilingual office productivity suite that is quickly becoming the main competitor of Microsoft Office. 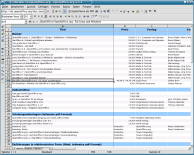 OpenOffice consists of the key desktop applications you can find in other office automation suites: a word processor, a spreadsheet, a presentation manager, a drawing program and a database. A word processor program offering almost all the features available in MS Word. It can open MS Word and Wordperfect files and directly create documents in HTML and PDF format. Other Writer's notable features are document templates, extremely useful when you need to create standardized documents (such as business letters or faxes) and the Stylist panel that allows you to change the style of an element (for example paragraph headings) within your whole document with a click of the mouse. A powerful spreadsheet that can open MS Excel files and follows almost the same model for formulas making the migration of spreadsheets made with the popular Microsoft application an easy task. Calc supports complex cell formatting functions and reusable data sheet styles through templates. Other important features are an advanced DataPilot technology through which raw data extracted from corporate databases can be used to feed a spreadsheet for further analysis and presentation, and a powerful tool for analysis of "what if" scenarios.